I love a good bun... and these Coconut Green Tea Cream Buns are divine! This is another one of those Chinese bakery staples. It was one of the only things I would pick out at the bakery, This Coconut cream bun and a pineapple bun... which I need to do a post on really soon. But back to this cream bun. The bao (Chinese for bread) was soft and flavorful, topped with shredded coconut and filled with a slightly sweet and silky smooth cream. It took me forever to find out what kind of cream it was. My parents always thought it was a whipped cream, but it was silkier than whipped cream and didn't have it's foamy bubbles. I thought maybe it was margarine or some other weird ingredient that made it so delicious. But after searching all over, I finally found a youtube video in Chinese that showed me how to make it. It was just butter! Basically it's the inverse of a buttercream. More butter, less sugar. Once whipped it creates a silky smooth texture that's truly addictive. The traditional version of this is a plain sweet cream, but I had to kick up and turned it green. I translated this recipe from a Chinese version I found online, so the measurements are a bit strange being that they're converted from grams. I have a scale at home, but I wanted to make it easier on my readers, because weighing ingredients is a bit of a pain to me. The other note is that the recipe requires the use of custard powder. It's a staple it a lot of Chinese bakery items and imparts a slightly yellow color and vanilla flavor. I was able to to buy it through amazon and I use it for other baked good recipes also. The bao recipe is fairly easy. You dissolve the yeast in some warm water for 5 minutes. Allow it to get bubbly. Then in a stand mixer fitted with a dough hook (you can also do this by hand, but who's got the time and arm strength for that? I certainly don't!) mix together the dry ingredients. Add the egg and mix together. Then slowly add the yeast water mix. You won't need to use all of it. I usually leave about 1/8th of a cup of water out. But you add the water till the dough forms a cohesive ball. The dough should be sticky but not too wet. 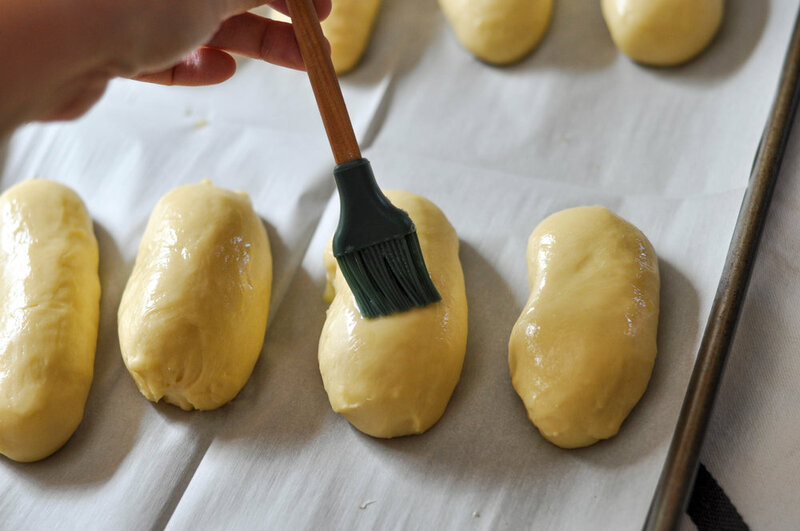 If it becomes too wet, add a dusting of bread flour to get it back to where you want it. Allow the machine to knead this dough for about 8 minutes. The dough will be come very smooth and develops a bit of a foot at the bottom of the bowl. A foot is dough that sticks to the bottom of the bowl. You can also test for doneness by pulling a piece of dough and seeing if it forms a window pane. 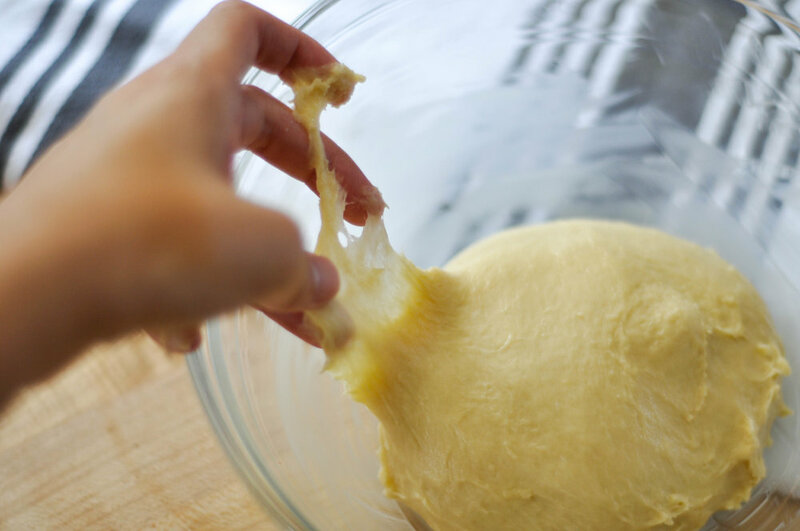 Pull the piece of dough with both hands, between your index finger and thumb. It should be able to be pulled so thin you can see light coming through. This means that enough gluten has formed. Form the dough into a ball and allow to rise for 40 minutes to an hour. This dough doesn't get super puffy and tall like most other recipes. It scared me at first, but after making it a couple of times, I found that its normal. You can tell its ready when you look at the side of the bowl and see air bubbles and when you pull the dough out of the bowl and see the dough pull into strands at the bottom of the bowl, it's ready. Divide the dough into 8 pieces and allow to rest for 15 minutes. Once rested form the bao shapes by rolling out each piece of dough to about 6 inch ovals. Starting from the top lengthwise, roll the dough, (like you would a cinnamon roll) and pinch the ends together. It'll look like an elongated football. Place these on a baking sheet lined with parchment, Allow to rise for 30 minutes. After 30 minutes, brush with egg wash and bake for 20 minutes. Allow to cool on a wire rack to prevent the bottoms from getting too tough. While they cool, make the filling. Beat softened butter with a bit of powdered sugar and vanilla. Then add the green tea powder. I've also changed this up by adding freeze dried strawberry powder. Both come out really pretty. Check out the pic on my Instagram! Once the buns are cooled. Split the buns in half lenthwise. Brush them with simple syrup and dip in the shredded coconut. Then using a star tip, pipe in the cream filling. Then dig in! This recipe makes smaller buns than the ones you find at the bakery, but I think they're just the right size for a mid afternoon snack! I had to fend off my family from devoting these before I took pics, but give this a try. #thesweetandsourbaker on instagram. I'd love to see how yours turns out! Sprinkle yeast over warm water and stir to combine. Allow to bloom for 5 minutes. 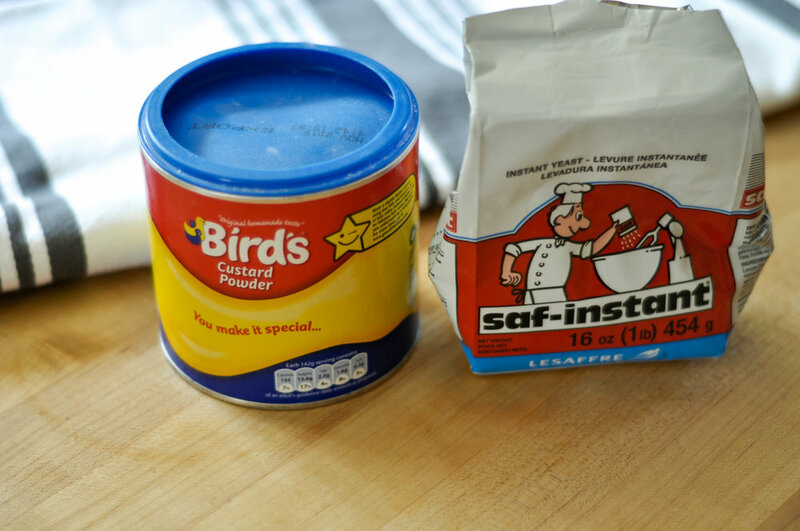 Mix Dry ingredients (Flour-Sugar) in a stand mixer fitted with a dough hook attachment. Add Egg and mix. Dough will look a bit crumbly. Slowly add the yeast water mixture till it forms a cohesive ball. You won't need all of it. I usually leave about an 1/8 cup. Dough will be slightly wet. If you add too much, sprinkle more bread flour to get back to the right consistency. Beat in Butter one tablespoon at a time. Knead in the mixer for 8 minutes. 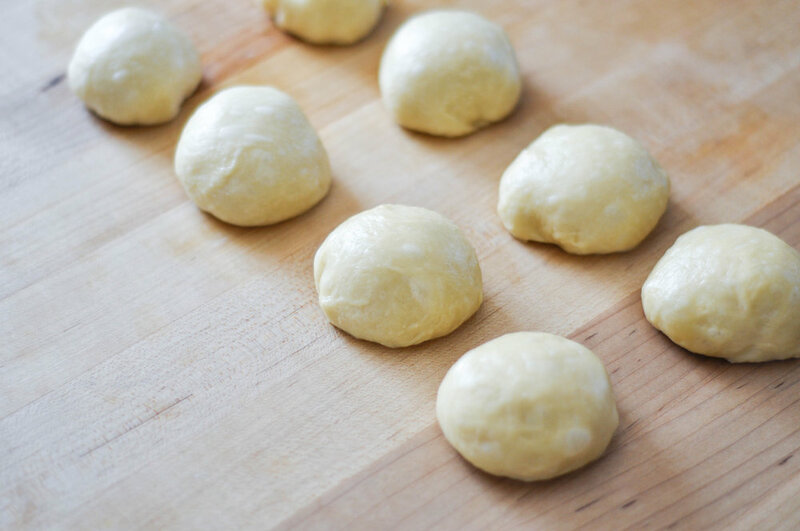 Form into a ball and allow the dough to rise for 40 minutes to an hour. Don't worry if the dough isn't very puffy. You'll know it's ready when you see tiny air pockets in the dough and the dough sticks to the bottom of the bowl in stringy strands. Line a large baking sheet with parchment paper. Turn the dough out onto a lightly floured surface and divide into 8 pieces. Shape into balls, cover and allow to rest for 15 minutes. Once rested, roll out each ball into a small oval. Roll the dough lengthwise and pinch the ends closed. It should look like a small elongated football. Place on a parchment lined baking sheet. Cover and let rise for 30 minutes. Preheat the oven to 350F. Brush each bun with egg wash and bake for 20 minutes or until golden brown. Allow to cool on a wire rack. Make a sugar syrup by mixing the 2 tsp sugar with 1 tsp water. Stir until the sugar disolves. Once cool. Slice each bun in half lengthwise. Brush with the sugar syrup and dip into shredded coconut. Make the Cream: Beat the butter with the powdered sugar and vanilla. Once throughly combined, add the green tea powder. Beat until smooth and creamy. Spoon the cream into a piping bag fitted with a star tip, Fill each bun with the cream. Eaten fresh is definitely best, but if you need, store in the fridge for 1-2 days. To reheat, Place in the microwave for 10-15 seconds.